Looking around me—at those walking down the street, in theater halls, restaurants, supermarket aisles, while on vacation, and even in fitness clubs—are people of various age ranges, and they’re stooping. What happened to them? When bone density has been eroded, the weight of the head and the biomechanics of the spine combine so that the only way down is forward. When posture is misaligned, you lose flexibility and range of motion, you suffer from back pain. You breathe less deeply, bring less oxygen to your cells and blood which in turn keeps your body from repairing properly. Furthermore, the direct line to your stomach via your esophagus being altered, and you increase your risks of heart burns. Worldwide, 1 in 3 women, and 1 in 5 men will suffer at least one osteoporosis related fracture in their lifetime. Osteoporosis causes more than 9 million fractures annually—a fracture every 3 seconds. In women over 45 years of age, osteoporosis accounts for more days spent in hospital than many other diseases, such as diabetes, myocardial infraction and breast cancer. The great majority of individuals at high risk, possibly 80%, who have already had at least one osteoporotic fracture, are neither identified nor treated. Osteoporosis takes a huge personal and economic toll. In the United States, it is estimated that by 2020, 61 million people will be diagnosed with osteoporosis—four out of five of these are women. Fifty-five percent of people over the age of 50 suffer from osteoporosis. On a yearly basis, osteoporosis costs the US government over 10 billion dollars. 1 in 5 people will end up permanently in a nursing home due to osteoporosis. 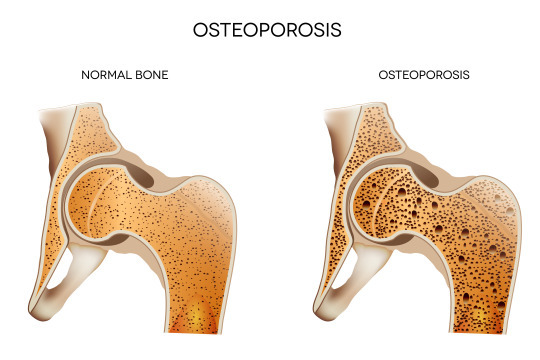 Myth 1: Osteoporosis is an old age disease and is most likely than not, inevitable. Fact 1: The length of time one spends living an unhealthy lifestyle IS the cause, not the age alone. By unhealthy I mean an unbalanced diet of processed and refined non-food, high in salt, sugar, hydrogenated fat, and chemicals/additive/GMOs; a sedentary life, the use of drugs in general, like tobacco, those illegal or licensed by Pharmaceuticals from anti-acids, non-steroidal anti-inflammatories to opioids. The exception would be marijuana. The reduction of estrogen and progesterone for both males and females during and post andropause and menopause does play a role in the body’s ability to absorb calcium. Natural organic supplements, however, can address that deficiency effectively. For more, see here and here. Myth 2: Osteopenia will eventually lead to osteoporosis, and osteoporosis can only be slowed down, not reversed. Fact 2: Both osteopenia (the early stage) and osteoporosis can be reversed. Bone is alive and can regenerate. The turnover (renewal) rate for the long and densest bones called cortical bones, such as those of the arms and legs is one hundred percent after 10-12 years. The turnover rate for smaller, less denser bone, called trabecular bones, meaning small beams, such as the vertebras, the heels, the fingers is 100% after 2 to 3 years. For more, see Dr. John Bergman’s video here. To make this happen, all you need to do is lead a healthy lifestyle: 1) Exercise rigorously 4 to 5 times a week with resistance/weight training and cardio. 2) Eat organic wholesome, non-refined, non-processed, low fat, NGMO food, preferably plant based. 3) Favor sea food versus poultry, and other red meats and dairy. 4) Do not rely on drugs, legal or illegal, (except antibiotics in extreme circumstances), as a mean to restore health. All drugs have side effects. Drugs never eliminate the root cause of the problem. That is why they are NOT effective and create a dependence and deterioration of the patient’s health in the long run. The Western medical approach to disease is containment, not healing. 4) Take organic plant-based mineral supplements because they are fully absorbed by the body. Osteoporosis is not only due to a lack of calcium. Rumor has it that bone is made up primarily of calcium. Bone is also 1/3 protein, 1/3 fat, 1/3 minerals. Healthy bone needs estrogen and progesterone, vitamins D and K 2, potassium, and fluoride. According to the University of Maryland Medical Center, “99 % of calcium and 85 % of phosphorous found in the body are in the bones and teeth”. 5) Make time to stretch before and after exercising, 6) Make time to rest, 7) Make time to live mindfully: with loving kindness, compassion, justice, honesty and integrity. When you are mentally at peace, your body functions optimally. For more information, see the China Study. Myth 3: The best drugs used to “treat” people affected by osteoporosis or osteopenia are dis- or bis-phosphonates like Boniva or Fosamax. Fact 3: Current medications in the category of Phosphonates such as Boniva or Fosamax prescribed to combat osteoporosis, actually increase risks of fractures because just like all synthetic drugs they do not work in concert with the body. These drugs totally impede the functioning of osteoclasts, whose role is to get rid of (resorb) old and useless bone. Instead, these drugs promote the formation of a layer of osteoblast cells around the old bone. The result is a bigger looking bone, which unfortunately lacks density, strength, and elasticity due to the fact that it just a wrapper around old bone which should have been discarded. In conclusion, you don’t have to be one of the stooped individuals I see every day. Balancing your spiritual, (not religious), mental, physical, and metabolic health is the fitness you can achieve, drug-free, to reverse osteoporosis. Check this site to know when to take a bone density test.